Mantle cell lymphoma (MCL) is a non-Hodgkin’s lymphoma that affects approximately 3000 people in the United States every year. The disease is characterized by a translocation between two genes which results in over-expression of the cell cycle, creating enlarged lymph nodes and is found in inner mantle cell B-cells. MCL readily spreads to bone marrow and therefore, can be irresponsive to chemotherapy treatment. Studies show the addition of rituximab to the current regimen of treatment for MCL greatly increases response rates. 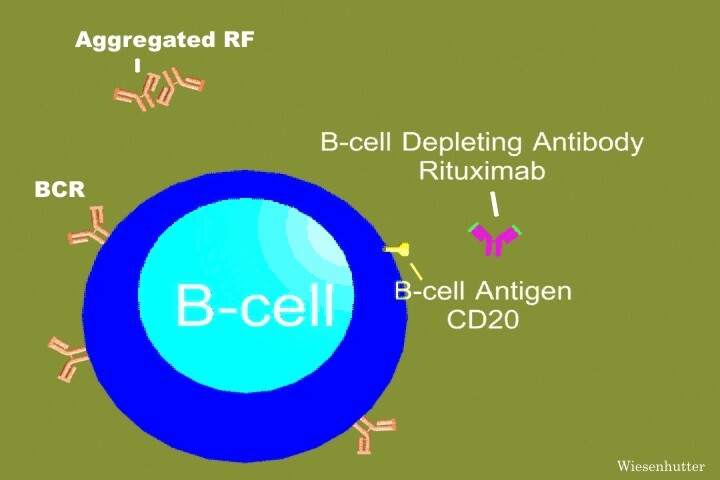 Rituximab is a monoclonal antibody which protects against a protein found on B-cell surfaces. The current routine for treating the disease is cyclophosphamide, doxorubicin, vincristine, and prednisone (CHOP). Combining these drugs with rituximab (R-CHOP), forms an alternative chemotherapy option for sufferers of MCL. Because chemotherapy is toxic to cells, good and bad, developing a mixture of treatments that show the best results in the least amount of time keeps the patient in the finest physical condition. A study showed 16 out of 26 patients treated with R-CHOP achieved remission. Five of these 16 patients needed repeated doses. The other ten patients did relapse, but did show a response to the treatment. The study also gave 38 patients high dose CHOP treatments. Of these, 33 patients went remained in remission. From this study, it can be determined that R-CHOP is effective in treating MCL. However, many patients do not need the rituximab and would be given the antibodies unnecessarily (full article). Chemotherapy is known to have devastating side effects. People of all ages are subjected to this treatment. It is sometimes the only option for those suffering from various illnesses, as of now. Researchers should start from scratch when trying to find the treatment of a disease, rather than seeing the effect of a medication for a different disease. Giving a person, who is already suffering from a deathly disease, a needless drug is almost cruel. Finding drugs that directly and specifically target a disease would minimize the unnecessary side effects of medication. Using drugs that are already known is a good starting point. This method of research has aided in the development of uncountable drugs. It is also important to get drugs to the public that do fabricate a response in patients so that there is some hope for recovery. Hopefully in the near future, drugs will be made highly specific to a disease and create fewer side effects.